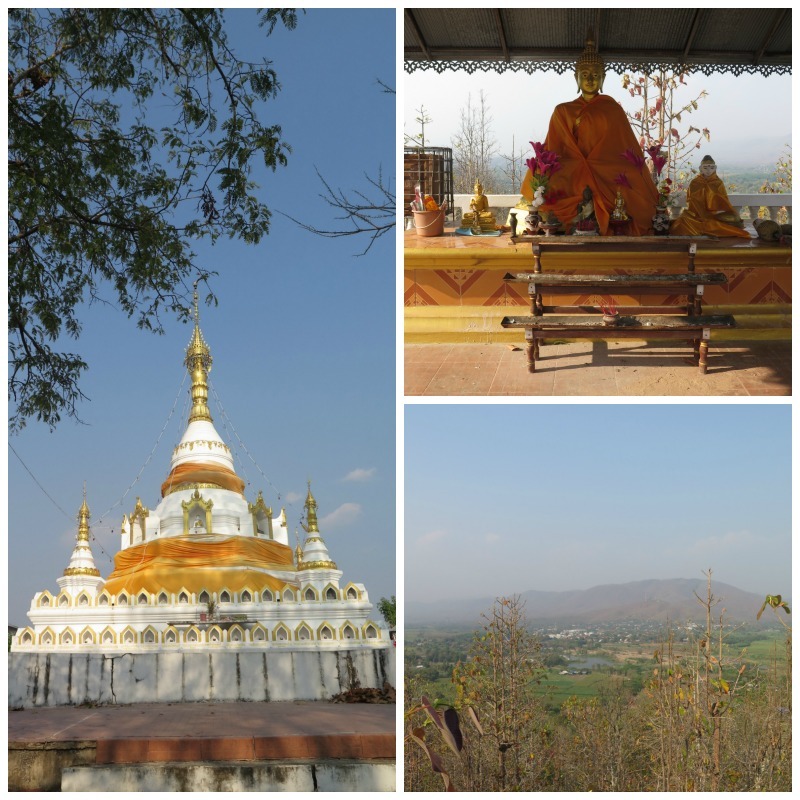 After a couple of days in Chiang Mai, we drove west to Mae Sarieng – a large district almost southernmost of Mae Hong Son. 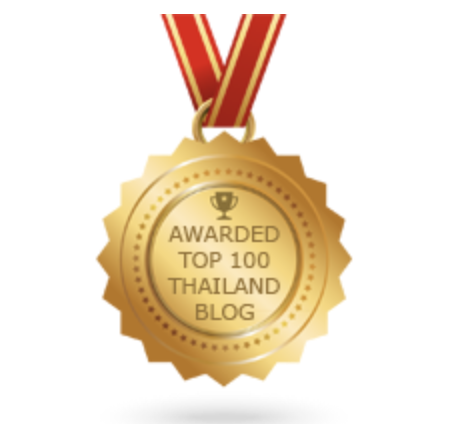 We took the highway 108 – or the ‘Hod’ route (after a major district) as Chiang Mai people would call it – that winds through mountain ranges. These hills are apparently the reason why this 194-km passage takes over three hours to cover. However, we had plans to stop along the way because we didn’t want to turn our vacation into a driving endurance test. So, after an unusually very huge breakfast at the Anantara Chiang Mai, we took off. Early. 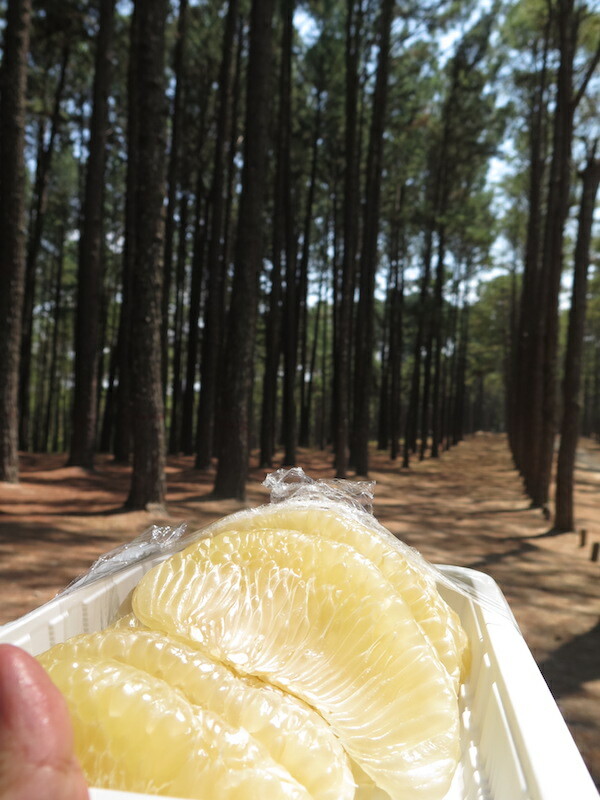 In our 4×4, apart from heaps of luggages, my extra pairs of shoes and my hubby’s ranges of emergency gears for mankind, were big packs of pret-a-manger pomelo and jackfruit (acquired taste needed here ￼ that we planned to eat for lunch at the Bo Kaew Pine Garden or Bo Kaew Botanic Research Station (สวนสนบ่อแก้ว) about 36 km. from Chiang Mai. 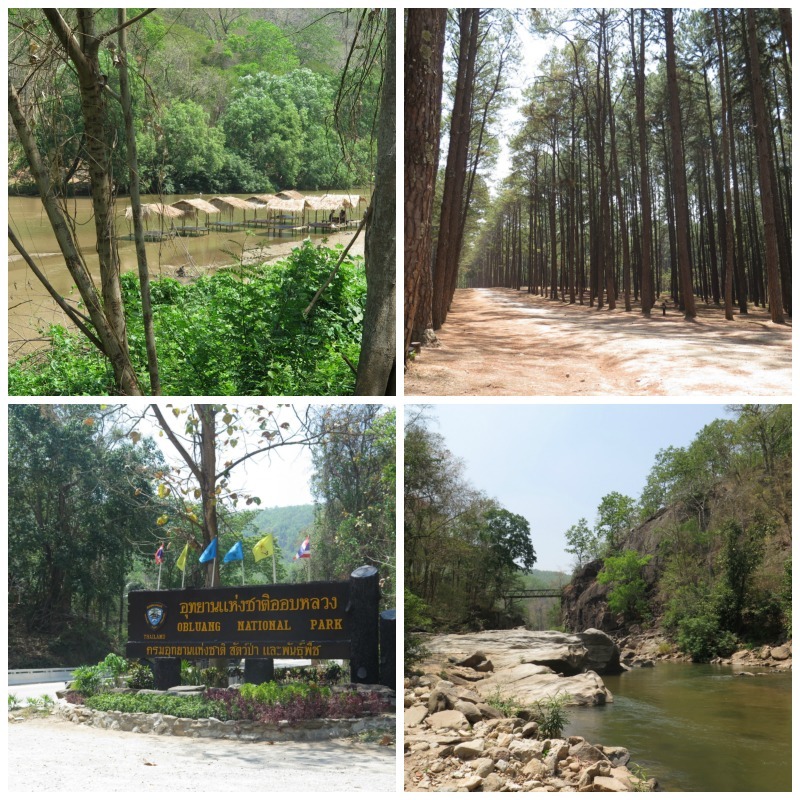 On Chiang Mai – Mae Sarieng route, highway 108 passing through the tributary of Ping river, Obluang National Park and Suan Son Bo Kaew (Bo Kaew Pine Garden). As you can see from the second picture from top, there are some spots that people could stop by along the winding (and dwindling in this case due to widely spread droughts) Ping River. Some merchants just set out semi-permanent rafts on the water, with food and drinks among the offerings. Most of the rafts were empty and quite deserted, but some of them were actually occupied with people rolling up their trousers, plunging their bare feet into the cooling, passing water. The Pine Garden was a fantastic place to stop, with quite a bunch of locals also there for picnic and noon-time escapade into the shades. This gorgeous place was first set up as a research station to sustain the local paper industry, with different pines and eucalyptuses planted in neat lines and now soaring into an almost a spiritual sight. The whole area spans over 2,000 rai or about 800 acres. I also learnt that savvy people also trek out here at dawn just to get a good shot of sunrise amidst these pine trees. ￼ The Riverhouse Resort where we stayed. Anyway, first thing we did when we reached MSR was checking in to the Riverhouse Resort which is perhaps the poshest hotel you’d ever find in MSR. We used Booking.com and since it was our first time using the service, we were a bit skeptical. After all, they didn’t ask for credit card or anything. Just do the booking and done! So, just to make sure we actually got the reservation, I called up the place in advance just to check. Good thing that I did because Riverhouse has two properties. And I made our reservation in the wooden row house under the name ‘Riverhouse HOTEL,’ whereas we actually preferred to stay at the hotel-style concrete building ‘Riverhouse RESORT.’ One good thing about traveling anywhere during low season is this. No fuss. No hassle. The hotel just switched us back to where we wanted at no extra charge. Our room has a river view with wooden floor, and bathroom’s dry walls covered with more wood. No frills but all clean and comfortable. With free WiFi, working air-con, still-new and fluffy towels and sealed drinking waters in recyclable glass bottles. 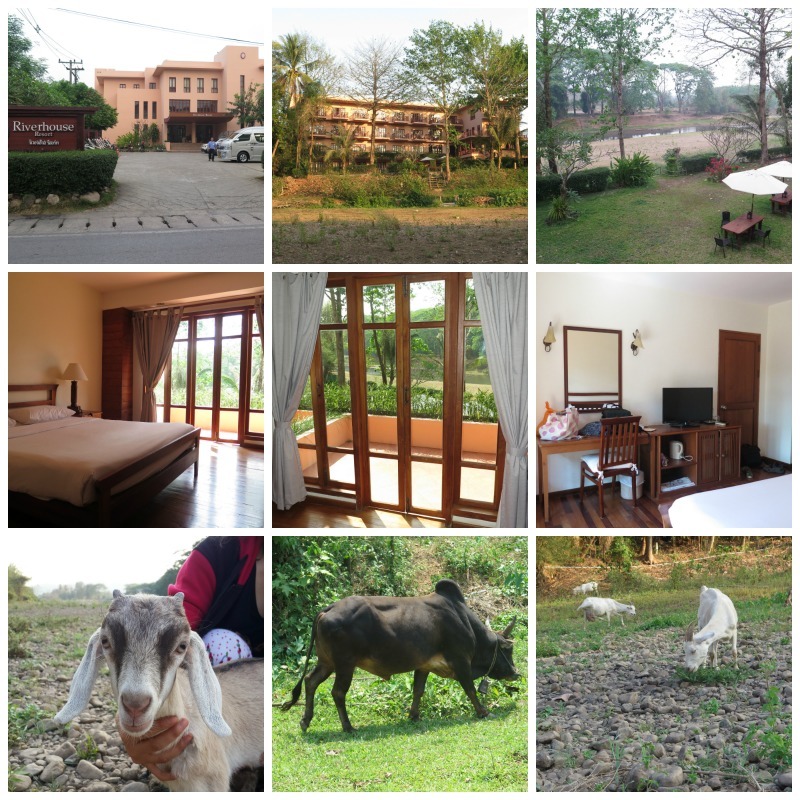 We got it at just Bt1,000 per night, and the breakfast was included! But the Yuam river ran dry during this very drought season, hence lots of roaming animals nibbling on forages. A gorgeous sunset from the balcony is something you wouldn’t want to miss when here. ￼ Mae Sarieng’s morning market at the town’s main fresh market. Next morning saw us at the morning market. For MSR people, morning means as early as 5am when the monks are still on their morning alms round. We, however, thought morning was 6am, hence a half-empty market with none of the said monks. 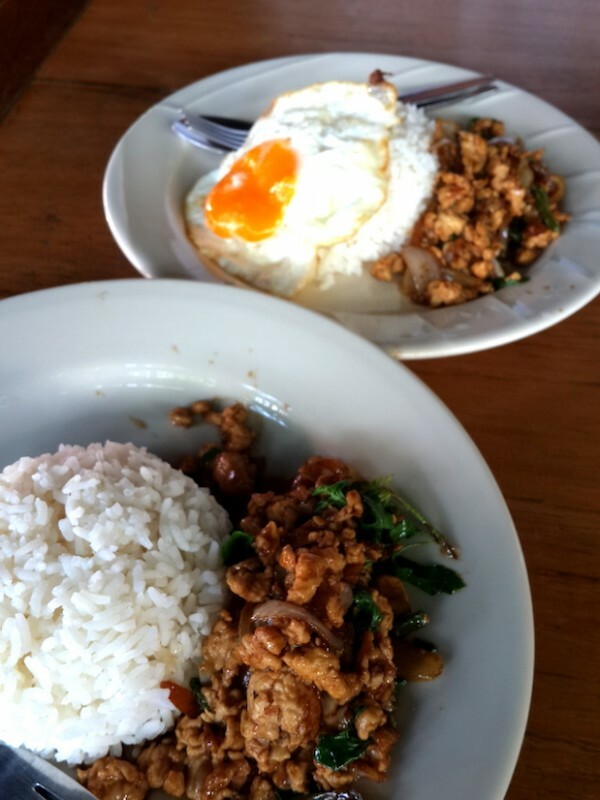 But we managed to walk around, tucked into some poached eggs and strong coffees with condensed milk from a stall (one and only stall all the way back off the covered fresh market area). Things that I liked most here were their glorious foraged vegetations. 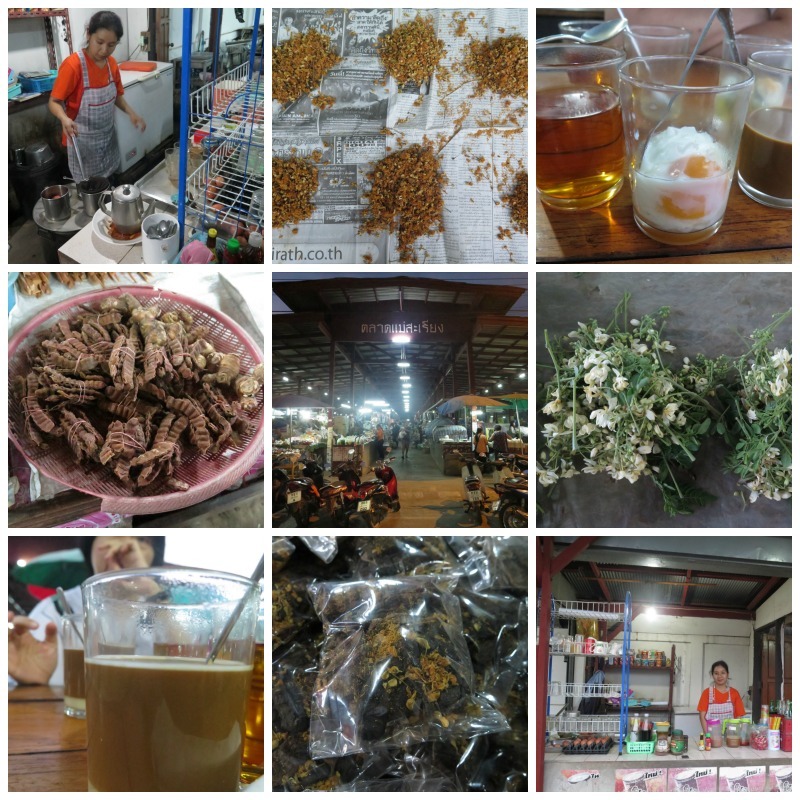 There are also some northern staples such as som poi (ส้มป่อย) (the brown ones that look like tamarind, soap pods or acacia concinna) and dok sarapi (ดอกสารภี) in dried and beautifully golden form. Some stalls sell these two separately, but some pack them together because the two are key auspicious ingredients for the upcoming Thai New Year or Songkarn during which the people of the north will soak them into the fragrant water. Som poi, with its sour properties, is believed to clear away bad luck and they use the vegetation as often as they wish to rub away some unfortunate patches. Oh..and the beautiful bunch of white blooms are the Moringa flowers (ดอกมะรุม) which are edible. ￼ One of the town’s major Phra That Temples – Wat Phra That Jom Thong in the southeast. 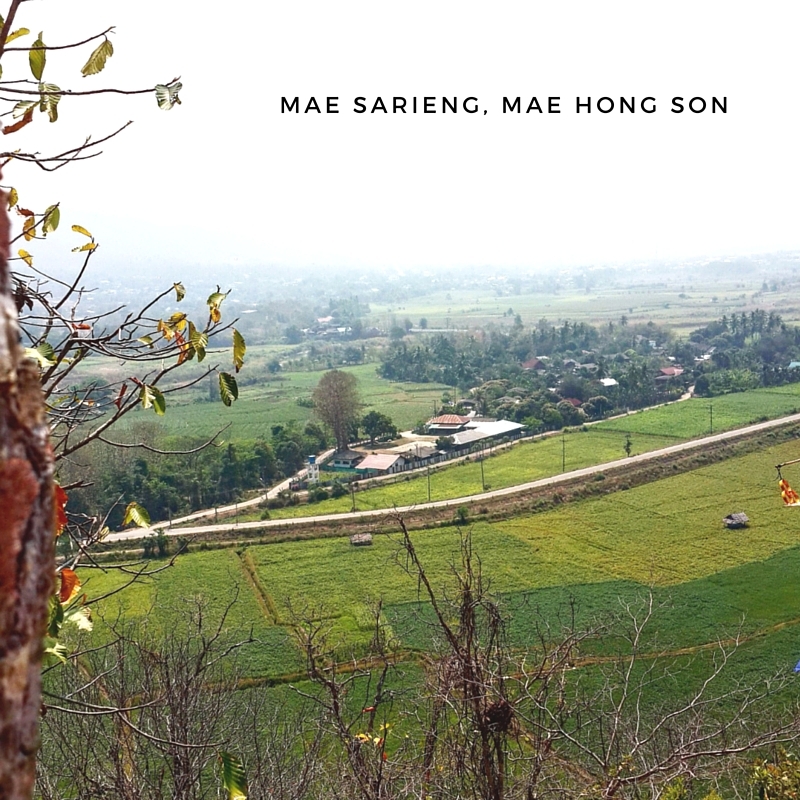 Mae Sarieng has been existing for decades. 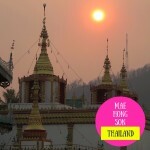 From what I read, this town was established more than 300 years ago as a satellite town of Mae Hong Son which, in turn, was also a satellite town to Chiang Mai. 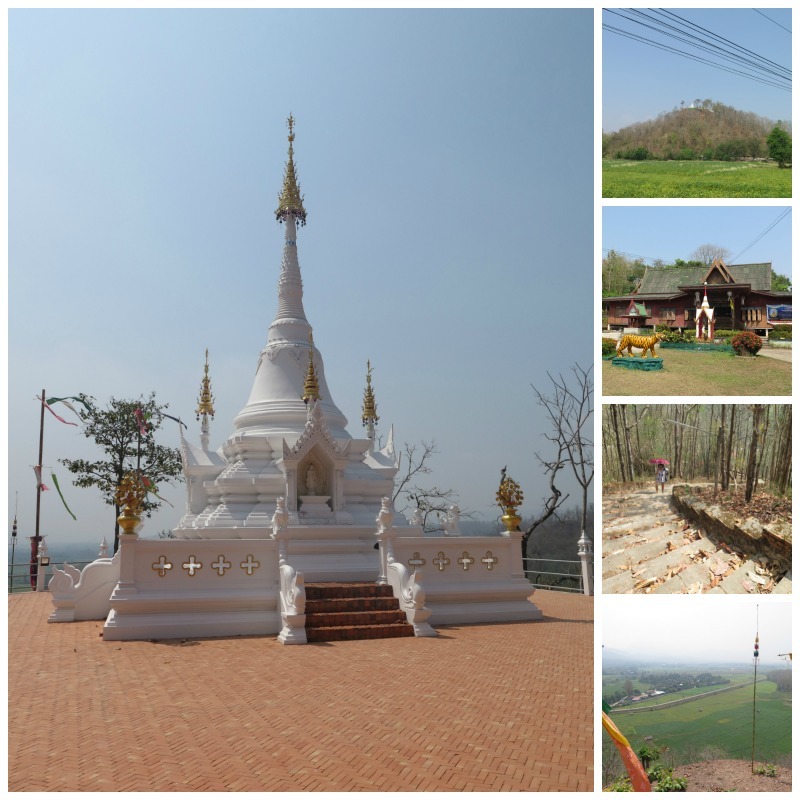 Being almost southernmost and roughly 200 kilometres down of Mae Hong Son (through an extremely winding road which would take up to another three to four hours), MSR was a major trading post in the old days in its own right. It was believed that the rulers of the days built four temples on all four direction: north, south, east, and west, to protect the town from all evils. So, if you like, and all these four temples are not so far apart, you can visit all four. We kinda took it easy. We visited two places one day and another two the next. Enjoying the scenic rice paddy field along the way. The highest and most demanding one being Phra That Jom Mon พระธาตุจอมมอญ which is on top of a hill in the northwest. But above, we enjoyed the vista of the green rice field and cool breeze of summer. One thing about these temples is that they are fantastic for enthusiasts of old things and memories. You’d find a lot of temples in Thailand’s north starting with ‘Wat Phra That’ followed by the names of the area or location. 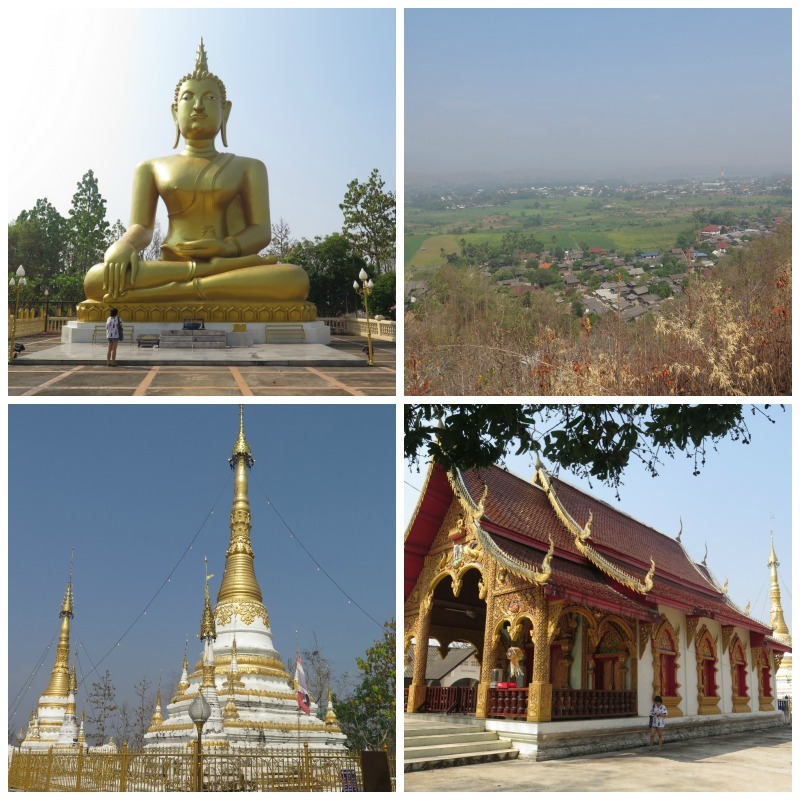 Phra That Doi Suthep in Chiang Mai and Phra That Lampang Luang in Lampang, for example. Mae Sarieng, being as close to Myanmar as just 100 kilometres apart, is a place where you could observe the cultural interchange in all these intricate temples. 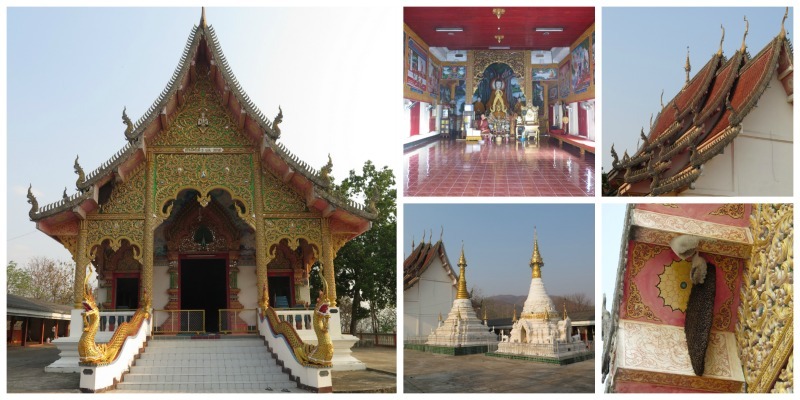 Tierras of carved wooden roofs typical to these temples are signature all over Mae Hong Son. And they are almost knock-out similar to Myanmar’s style temples. Phra That, if you wonder, is the round stupa that is the main sacred monument in the temple. 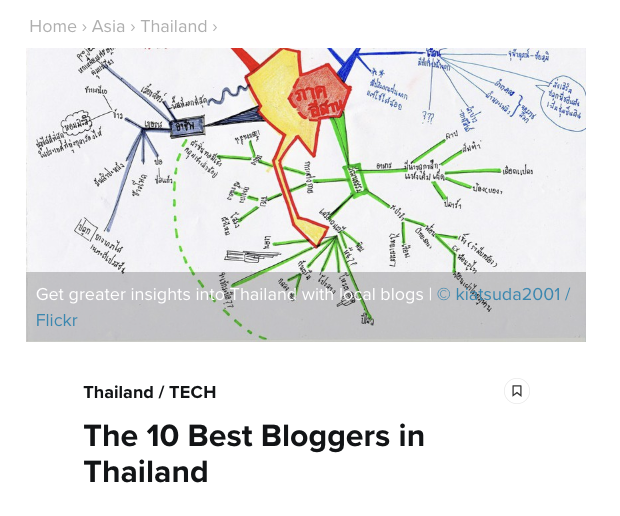 Mostly they are tucked behind the ubosoth like Phra That Jom Jaeng and Phra That Jom Thong. Sometimes, however, they are built in a separate area like in Phra That Jom Mon and Phra That Jom Kitti. ￼ Wat Phra That Jom Mon. The highest of the four, perching on a hill in the northwest of the town. MSR is a tiny town. You’d love it if you like your holiday quiet and peaceful. 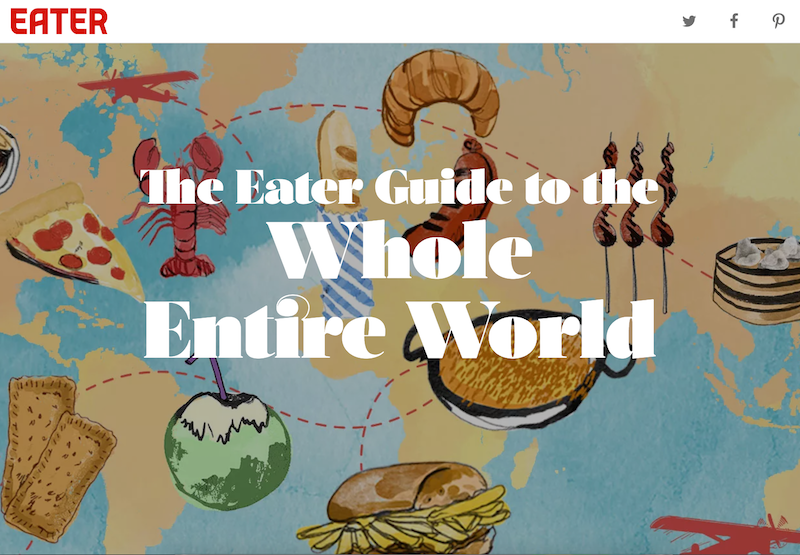 There are quite a bunch of local restaurants. But we only had chances to try two places…no… in fact, we were too lazy to explore and sticked to the tried and true. 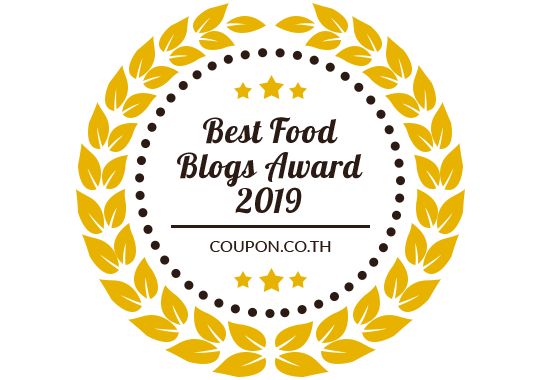 Also, I am no longer a fan of beef and pork (health and humane reasons), so it was kind of difficult in this area of pork and beef eating. Anyway, we got three places to recommend. One is the coffee shop at the Riverhouse Resort where we stayed. They served ubiquitous Thai dishes like pad thai, stir-fry noodle and rice. Quite delish. Next door to the hotel is Red Wood House Restaurant (ร้านอาหารบ้านไม้แดง)which we had simple stuff like rice with chicken basils and a bowl of chicken tom yum. Quite spicy and delicious. We also had this delicious lunch at Inthira (ร้านอินทิรา แม่สะเรียง) which I guess is the one and only established ‘restaurant’ in MSR. 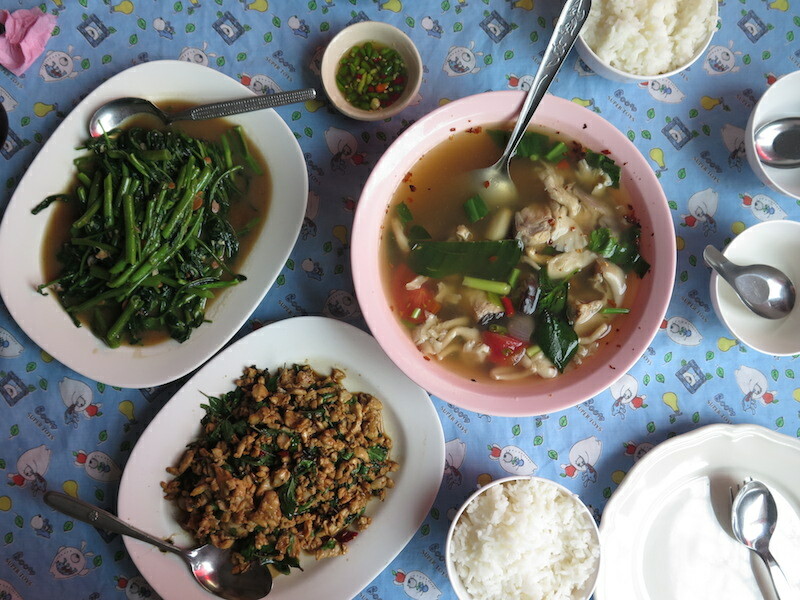 Inthira serves typical Thai central dishes with some local ingredients, such as fresh water fish from the nearby Salawin river, throwing into their daily specials. 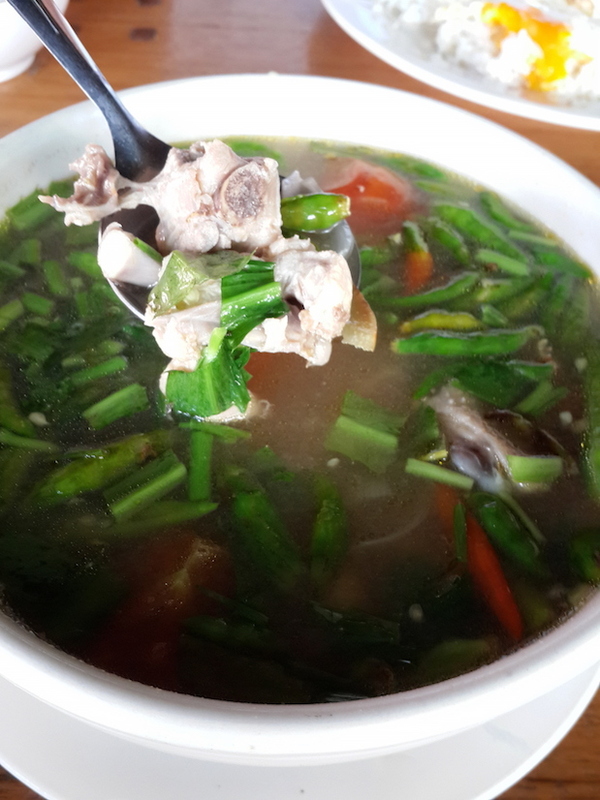 And we enjoyed their fish tom yum soup very much. Phra That Jom Kiti at the southwest of Mae Sarieng town. And if you just got enough of the temple, you can venture into the nearby SUPPORT boutique shop ** SUPPORT is “The Foundation For the Promotion of Supplementary Occupations and Related Techniques under the Royal Patronage of Her Majesty the Queen” in which she helped locals perpetuate their arts by turning their folklore crafts into occupations. SUPPORT’s MSR branch is fantastic place for those looking for bright costume choices handmade by hill tribe folks. I personally think that this kind of dress is so cool, fun and real comfy to wear. Made from hand-spun cotton in bright colours, these can be paired with a lot of urban accessories. Or not. If you want to showcase the artsy hand sewing works. The shop’s foyer is also a small exhibition of Mae Sarieng’s long history, their beautiful hand-woven fabrics and the four revered temples. **Thanks to its rich history, Mae Sarieng used to have their own museum, but it’s now permanently closed after destroyed in a fire. Phra That Jom Jaeng also in the northeast of Mae Sarieng town. 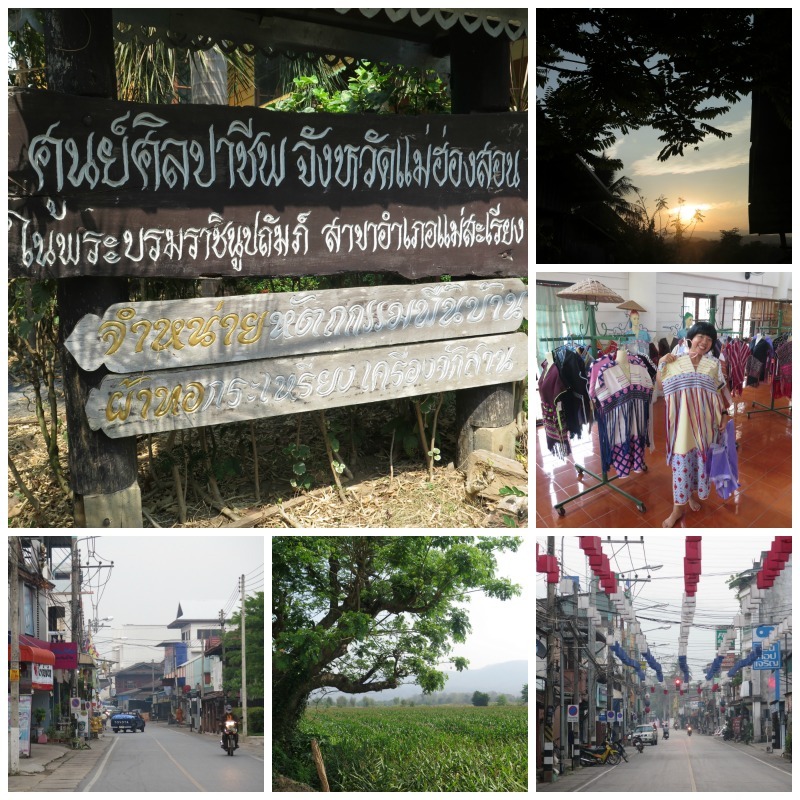 ￼SUPPORT shop on Highway 108 has beautiful collections of hill tribe costumes. So colourful and fun. 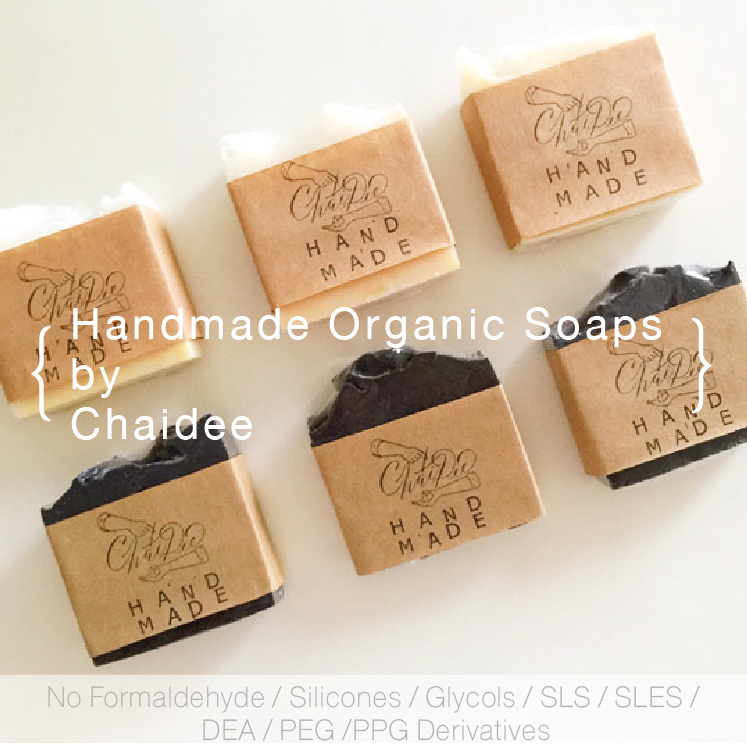 And all handmade. So gorgeous. People would say we were there in the north parts of Thailand at a strange time. Low-season = nice and quiet, yes, but also a drought and fire season. March, they said, is the month that many locals set fire in the forest. Some say they do it to hunt wild animals, some say this is their regular ritual to prepare the soil for the next rice-growing season. Some say, they just didn’t have anything better to do. The morning was the worst time with the smoke at its thickest (forget morning breeze), because they seemed to set the fire during the night when it was more difficult for the park rangers to go up there and catch them. Things usually cleared up a bit in late mornings and afternoons, though.